On our way into the Jungle! We drove at a windy pace up over the mountains past Ocosingo and back down on the other side into the jungle area of Palenque. 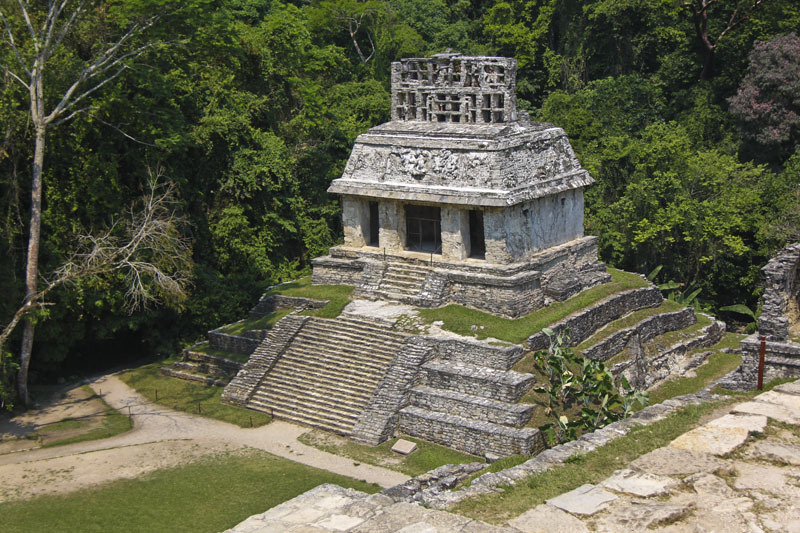 Palenque was a small town with the typical Mexican amenities you find in towns off the main highways except this town had another road that lead straight into the jungle and the ruins of Palenque. 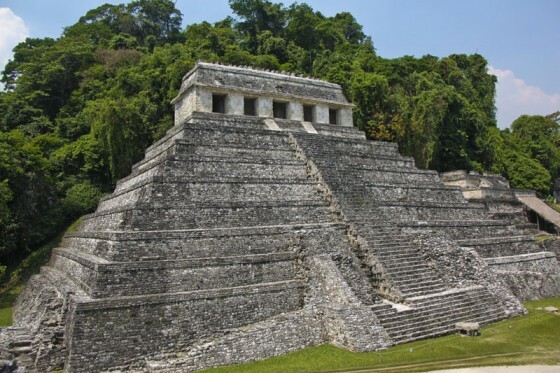 We read that in Palenque you sleep in the jungle and that’s exactly what we planned on doing. We drove straight for it and hit a dead end of a road that only continued a little further to reach the ruins, but we took a left just at the end of the road into an area called El Panchan. 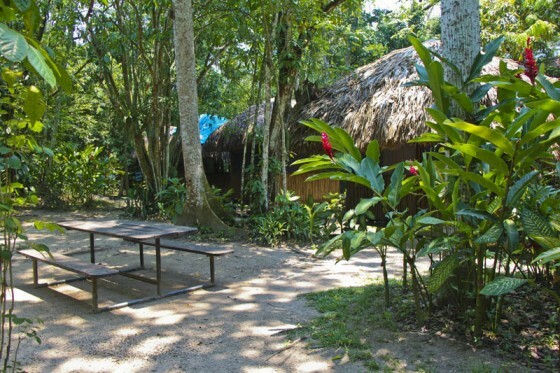 El Panchan was nestled right in the middle of the jungle and it had places to sleep or camp and a restaurant which was touted as one of the best in town. We stayed at one of the accommodations called Jungle Palace and rented a small cabaña which had a bridge that crossed over a small creek (I called it the mosquito breeding ground.) 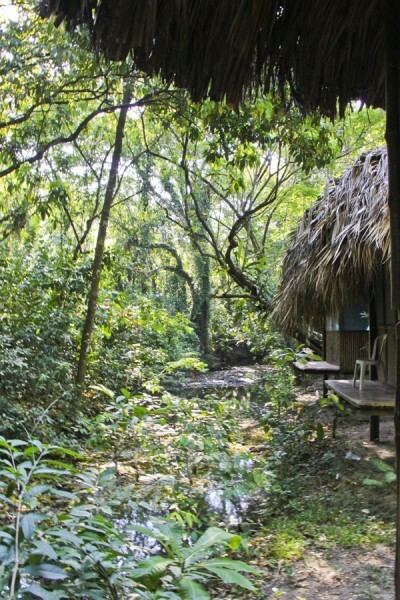 Our Cabaña sat right next to the creek and had simple amenities; a bed, a table, and a back porch area where we could set up chairs to sit and listen to the jungle. In the jungle you don’t have to worry so much about the sun beating down on your backs and making you hot, it was all about the humidity here and boy was it sweltering. We couldn’t so much as sit and rest without being covered in sweat. I’m sure if we stayed there long enough we would get used to it, but even the fan in our room wasn’t working well so the little relief we could have wasn’t there to help us keep cool. One of the first things we did was rest for a bit. Steve’s stomach was bothering him, we seem to get small bouts of stomach issues here and there from the food we eat so we decided to take it easy and hang out on our porch and relax. We had fun watching the little fish in the creek below and listening to the birds in the jungle. Later that night we were able to hear some monkeys and also see some jungle fireflies soaring around the high branches, it was amazing. And luckily our room was very well protected from bugs with mosquito netting so we would rest easy at night. The following day we woke up feeling much better and decided to get a light breakfast at the restaurant called Don Mucho’s which was conveniently situated right in the middle of the three jungle accommodation. We had some fruit and toast and then decided to head off toward the ruins of Palenque! We were told we could walk there from the entrance of El Panchan, which butted up right next to the entrance of the ruins, but the walk ended up being at least 3-4 km and it was very humid and hot. We finally got there and entered the ruins on an opposite end where most people usually enter so it was nice to walk through the jungle paths with fewer tourists staggering about. 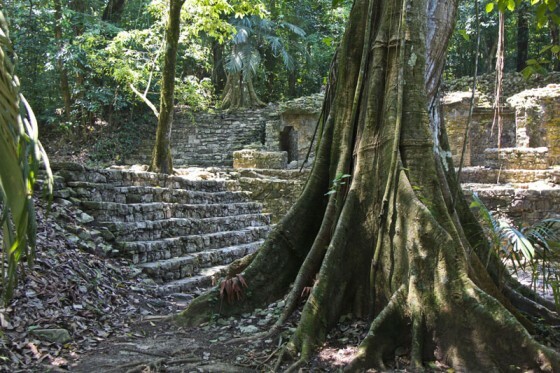 The area of the ruins we saw first were tucked right into the jungle. It looked like something straight out of Indiana Jones for real! And the great part about Palenque was you could climb almost all of the ruin sites unlike some of the previous areas we had seen having being blocked off. As we continued we finally reached a large clearing where most of the giant pyramids stood. We took lots of breaks walking around this ruin site as the heat and humidity just drained any energy we had. We still managed to climb most of the pyramids and take in the ancient views. We loved how this site was burried deep in the jungle. Apparently what we saw was only about 3% of the entire city of Palanque. The remaining 97% was all around throughout the jungle and hadn’t been excavated yet I believe mostly due to the destruction they would be causing to the ecosystems there if they did excavate. 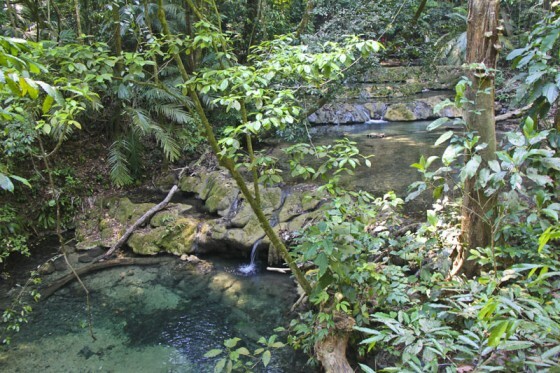 The ruins were a beautiful site and there were also lots of small rivers and creeks running throughout the jungle which looked so enticing with the heat surrounding us. Curse those ropped off barriers to the water and the “No Pase” signs!! After visiting the ruins we started the grueling sweaty walk back to El Panchan. We were hoping a truck might drive by and we could give the driver a few pesos to take us up the road in his truck bed. A combi bus did drive by and we crammed in there with some other locals and they dropped us off right in front of El Panchan. I don’t think I have ever enjoyed riding in a van with the windows open as much as I enjoyed it on that day. We got back to El Panchan and sat over in Don Mucho’s again to see if we could find a man named Gabriel whom our friend Jose back in San Cristobal mentioned we should talk to about jungle tours and such. We asked the staff at the restaurant if they knew where he was and they called him over for us. Gabriel was the most polite and interesting person. He enjoyed talking to us and telling us about his tours that he offered. We were excited to hear that he was taking a tour through the jungle in about an hour so we decided to tag along. 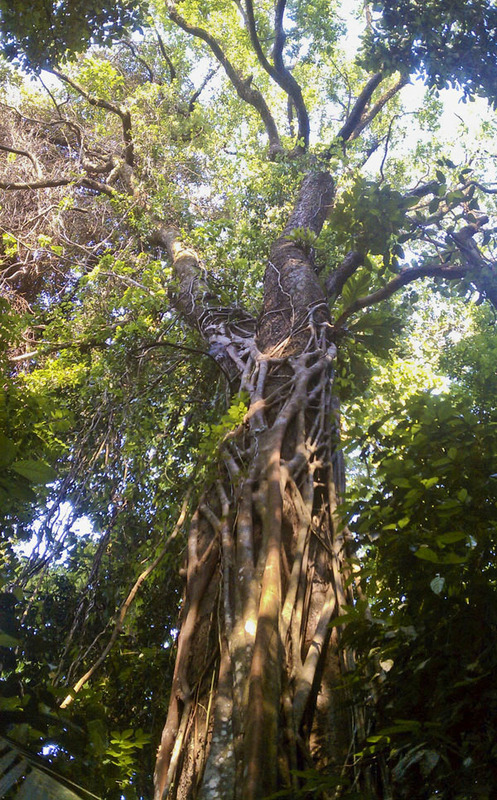 The pictures I took in the jungle were with my camera phone and not my good camera. I really wanted to experience the jungle without the burden of being a tourist so I left the bulky camera behind and took only the clothes on my back and a small satchel with some bug repellent and my phone for a few pictures here and there. Just before entering the jungle, he brought us to his friend, a giant tree near the entrance, and asked us all to join him in asking the jungle for permission to enter. He said the jungle understands any language and will listen to anyone who speaks to it. He said he usually asked for permission to have the jungle keep him safe and show him all of the secrets she has to offer. He believes the jungle is a living being and should be respected. So we all knelt down and put our palm on the soil and spoke with the jungle asking for a safe journey throughout. 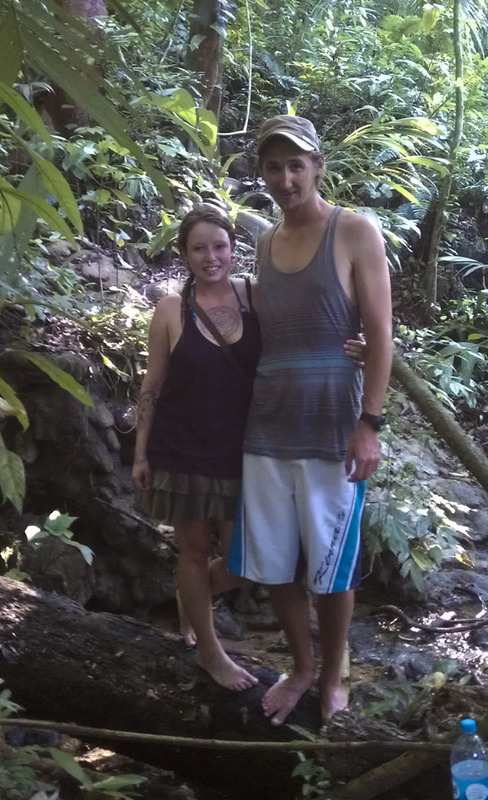 Our first stop on the jungle tour was a swimming hole and OMG was it refreshing. It was JUST what we needed in that humid climate. The water was crisp and cool and just perfect. Gabriel wandered off while us and three German folks who tagged along for the tour waded in the pool and stood under the waterfalls. Then he returned with some special clay that he found which he kept in a wide leaf and gave to us to put on our skin. He said it was good for mosquito bites as well. He also showed us a secret hidden spot at the pool just under the waterfall where you could duck under some rocks and enter a small cave in the water. There was plenty of room for about two people and head room to breath and there were stalactites hanging just above your head. It was awesome! We each got a chance to go in there and check it out. 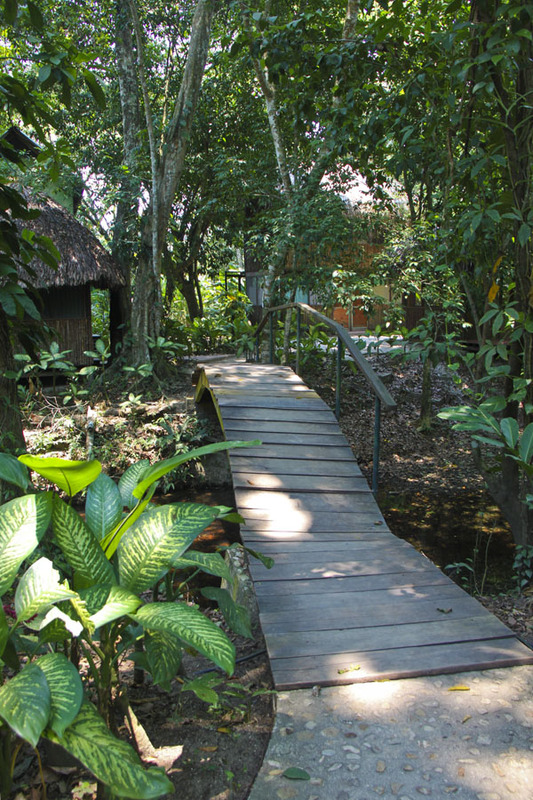 After swimming for a while we headed back into the jungle looking and listening for more plants and animals. We saw lots of birds such as doves, motmots and even some tucans! We later heard the screams of the monkeys which sounded like giant gorillas in the distance, but they were actually only tiny little things. I always wondered how those booming calls came from such tiny creatures. We wandered through shallow pools, hopped rocks, climbed small hills and even climbed through caves! We also found Mayan ruins that had not been excavated and that had been consumed by the jungle. We found small pieces of ancient carved stone and holes which would lead to entrances to decrepit buildings. THIS was the real Mayan jungle experience we were hoping for. 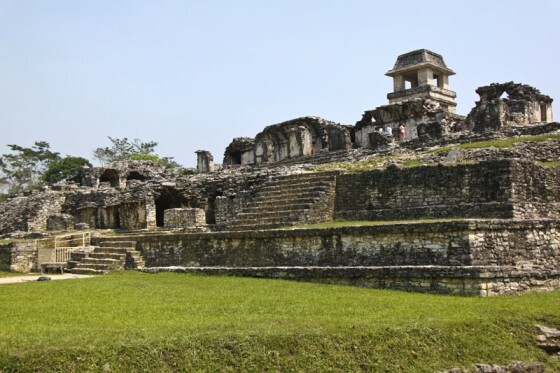 The sun was finally starting to wane and we needed to head back as the entire area was “closed.” The part of the jungle near the ruins we were in was apart of the Palenque ruins and was only open between the hours of 8-6. So we wandered back following the knowledgeable Gabriel who knew every path and secret of the jungle and found the road again after many wonderful and playful hours in the jungle. We started hoofing it back to El Panchan as most of the vehicles that could take us back were being blocked off. We managed to reach the museum area (which we saw earlier in the day) and a taxi was nearby so the Germans decided to pay up and take it back. Steve, Gabriel, and I kept walking and eventually ran into a truck which we hopped into the back of free of charge (Gabriel knew the people inside) and got ourselves a breezy ride back to El Panchan. We thanked Gabriel and told him we would see him later that night at Don Mucho’s! So later we had some dinner at Don Mucho’s and a couple of beers and enjoyed some live music and watched the young and old couples dance to some Mayan/Mexican inspired music. The restaurant was packed and everyone was having a blast. It was fun to people watch. We got to see Gabriel play the drums in the local band (he said he was filling in for another drummer.) We were starting to get a little tired so we headed back to our cabaña to get some shut eye. We were planning on staying one more day and taking advantage of some of Gabriels other tours, but that morning it was my turn to have a bit of an upset stomach. 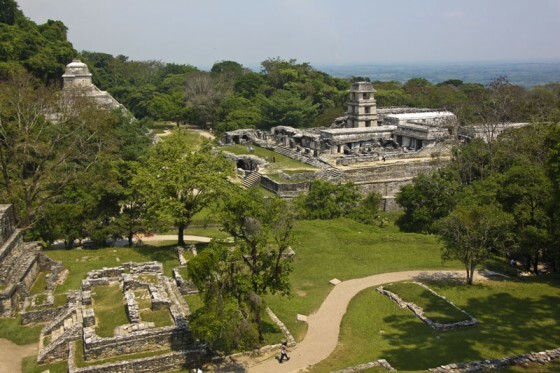 So we decided to pack our things and head out of the jungle onward toward the city of Campeche instead. We saw Gabriel in the morning and said our goodbyes and told him on our way back through Palenque after we travel through Central America we would stop by and stay again. Despite the humidity and heat, Palenque was a beautiful place and the sights and sounds of the jungle were definitely something not to be missed. It was a magical place that teemed with life and people peacefully living amonst it. Everyone there was wonderful and gave us a real jungle experience. Onward to Campeche! 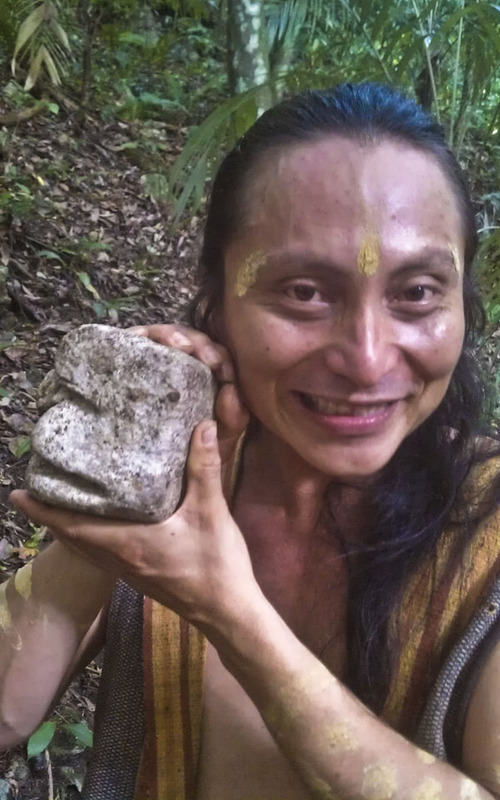 Wow, those jungle pictures are amazing and that picture of Gabriel is really cool. Pure Mayan blood there! I love those huts and the palm leaf roofs, very authentic. I bet the jungle sounds were amazing to listen to both during the day and evening. I bet it sounded like the Tiki Room at Disneyland…haha! What a treat to be in those Indiana Jones style ruins… :) Can you just imagine the life style in those early days of the Mayan civilization? WOW! Anyway, be safe in your adventures and have a blast traveling.